Cardamom Club - Eco friendly plantation resort at Thekkady in Kerala, India. 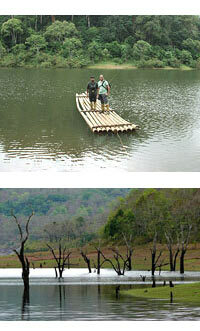 People oriented and park centered community based ecotourism is the hallmark of Periyar Tiger Reserve. These programs are conducted by local people responsible for the surveillance of the vulnerable parts of the reserve. By taking tourists along, they are involved in the conservation of the forests of Periyar and some valuable revenue is generated for community welfare. People who once made a living by illegal operations in the forests have since become forest protectors and earn their livelihood through these programs. Hence, as a visitor, when you join them in any of these programs, you are directly contributing towards forest conservation and community welfare. Make sure to visit the beautiful Periyar Tiger Reserve when you go for your holidays in Goa India. This will prove to be a relaxing and worthwhile getaway for the whole family. Different nature trails traversing diverse habitats form the trekking routes, generally 4 to 5 km. in length. This is an interpretive programme offering excellent opportunity to watch birds, butterflies and other wildlife. The trails often pass through evergreen and moist deciduous forests interspersed with marshy grasslands. The programme is offered between 7.00 am. and 10.30 am. and between 2.00 pm. and 3.00 pm. and lasts for about 3 hours. A maximum of 5 persons can go for trekking at a time along each nature trail, accompanied by a trained tribal guide. The Nature walk is the right programme to feel nature, hear her whispers and smell her flowers. This is a dawn to dusk range hiking and rafting programme through some of the richest forest tracts of Periyar Tiger Reserve. Starting at 8 am from the boat landing, a mosaic of habitats will be traversed before the party gets into rafts made of bamboos. The forests are rich in bird life and arboreal animals like giant squirrel and Nilgiri languor. The rafting is for about three hours and one gets a panoramic view of forest-clad hills reflected on the lake. Animals like elephant, gaur and sambar are sighted keeping close to the edges of the lake. The team hitchhikes back to the boat landing by about 5 pm. An armed guard and 4 guides will accompany a maximum of 10 tourists. Tea, snacks and packed lunch will be served during the journey. The programme is unique in being conducted by a team of poachers who turned protectors of the forests. 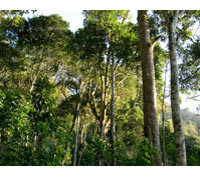 The team members are hardy and dependable with an intimate knowledge of the forest terrain. The programmes are 1 night/2 days and 2 nights/3 days. The first day’s trek starts at 9 am and ends by noon in the second or third day. The team consists of a maximum of 5 visitors, 5 guides and 2 forest officials. Normally 20 to 35 kms. of trekking distance will be covered, depending on the route chosen. Here, one may chance to encounter much indigenous wildlife like Nilgiri langur, giant squirrel, elephant and who knows, even the tiger! The trek route passes through hills and valleys with a variety of tropical plants and wide-open spaces. Enroute vegetarian meals will be prepared and served and country tents will be pitched for holing up in the night. Trekking groups are accompanied by armed forest guards with good communication equipments, and geared to face any emergency situation. Remember to listen to unusual and strange adventure stories of the former poachers, now your guides and protectors of the forests. This ride would be through countryside villages with stop over at intermediary places. The duration can be stretched to any length of time as per actual requirement of the tourist. At a time only two tourists can take the ride while the others in a group could trek along and change over accordingly. Experienced elephant Master will guide & accompany the tourists during the ride. Riding an elephant takes you back to the royal era, when only the Kings use to ride on these majestic creatures. Elephant Safaris are equipped with a howdah, a large seat on which they and the visitors sit. More of all an elephant safari tour in the tropical wildlife sanctuaries of India gets you up, close and personal with these majestic animals. All the above programmes are conducted with prior entry permission from Kerala State Forest Department at Periyar Tiger Reserve and in co-ordination with the trained Guides & Forest Guards. Visitors who are physically fit and aged between 15 - 65 are advised to take the tiger trail. Visitors should be serious nature lovers willing to sacrifice some of the luxuries and comforts of a hotel. © 2008 Wildlife Periyar. Created by: ipsr solutions ltd.